Prophet John will be in attendance at the Reykjavik Bacon Festival as it returns for its 6th year. As part of the festivities and in conjunction with Reykjavik’s Gay Pride week, Prophet John will be performing a mass wedding in the name of bacon. 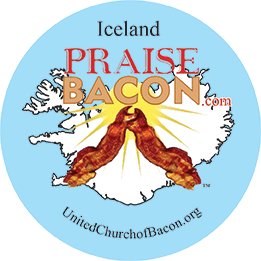 So if you happen to be in Iceland, swing by Skólavörðustígur Street on August 11th and help us Praise Bacon! Click below to learn more about the Reykjavik Bacon Festival’s history as well as the other global Blue Ribbon Bacon Festivals! Blue Ribbon Bacon Festival is the world’s premier baconfest taking place in Des Moines, Iowa with touring locations in Colorado, Las Vegas and Iceland.